Well, Lucky pdf, an arts collective who are much cooler than me, wrote “Don’t work for free”. But I would contend we both have a point. The work is its own reward, yet has monetary value. That is in essence the beauty of both writing and art. Surely nothing worthwhile is ever made with a price tag in mind. And so the art world is as full of freebies as it is full of art fairs and auctions. We need hardly enumerate the perks of engaging with this system: free admission to galleries, free wine at openings, free press releases, free selfie opportunities and free reviews online. Then a middle tier: blockbuster shows cost up to £20; catalogues can cost even more; editions will set you back three figures. But all of the above augment a pleasant middle class lifestyle. The gateway comes next: work by ‘name’ artists costs between the price of a car and a house; at auction, you could spend millions; if accepted as a collector you’ll become an art world VIP. At this point you may want to loan one of your works to a museum, thus increasing its value. Or you may want to bequeath all your art to a provincial gallery, ensuring immortality: a good trade. Artists themselves meanwhile have to speculate to accumulate. At the very least they will need to buy materials. At worst, for their pockets, they’ll manage to rent a studio or hire assistants. Journos can get by with a laptop, a pad and a pen, and a voice recorder. Utilised to our advantage these will gain enviable invitations to press launches and press trips. After that point, whether visual artist or art writer, you will want to sell work. This is as difficult as it sounds. We are legion and there are always pre-validated colleagues out there with more talent. So I found myself coming back to that pearl of wisdom from Lucky pdf. It struck me as quite an important principle. Giving away art or giving away writing does no one any favours, surely. And yet we have social practice, a genre of art which thrives off what is freely given. And yet we have blogs like this one, which never make a bean. And on social media, every darn thing is free. I guess that moving forward, the approach should be: don’t give away more than you earn. Be you an artist, writer or curator, you should try and come out of your professional activities in the black. 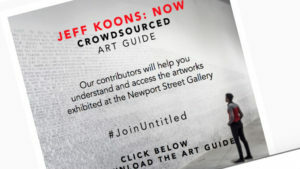 With that in mind, it’s worth considering a new phenomenon: the crowdsourced gallery guide. Back in August I was invited by one of these to volunteer some commentary for a current London show. The email, from a Michael Bouhanna from Untitled, captured my imagination because the featured artist was Jeff Koons and the gallery was Damien Hirst’s. I have written on both, but who hasn’t? It can’t even be said that the request came from either of the two great men. This untitled gallery guide was positioning itself as a public service, as a kind of digital intervention. This was supposedly in response to the lack of clear interpretation which goes along with some of the work in Hirst’s personal £100 million collection of art shown in his purpose built gallery. But no matter how frequently I have worked for free, to promote myself or support an artist, I would never for a moment think that the Murderme collection or Newport Street Gallery needed my help. In return Bouhanna offered the chance to join a community of ‘passionate’ art enthusiasts who may or may not attain VIP status at future shows or art fairs. That doesn’t really appeal. Indeed I found more community belonging on my Facebook wall where, being a blogger of the passive aggressive variety, I eventually cropped up to share my dismay at this cheeky request. Writer Ben Street and artist Paul Brandford, who are both already VIPs to me, soon reported having similar experiences with Untitled. Bouhanna clearly spread his net far and wide. The guide itself later arrived. One wonders if he paid the designer. Punters might be better off reading a broadsheet review and/or Mr Koons’ Wikipedia page. The episode just threw into relief a truth about the market in which art finds itself. The rich get richer and sometimes it gets rich off studio assistants, interns and on occasion art bloggers. But the wonderful thing about blogging is this: you can pick or choose what you write about. I hope Michael if you are reading, you will understand why I chose not to write for you. Marvellous,you’re absolutely right, if you’re going to work for free you should be writing exactly what you want to write rather than be incorporated into something else in which you’re just a pillar to support someone else’s success. I myself have, to my chagrin (though with the best and non-profit-making intentions) sometimes in the past asked people to contribute to projects for free if I had no budget– though most often I was able to pay a little something– but that was years ago and I never would again. Collectivizing creativity can be a dangerous thing where nobody finally gets what they want, and there’s no guarantee it’s going to make any more impression than if every one with an idea went their own way,and at least they can clearly see the impression they’re making that way. I liked the part about the response you had on Facebook too. A brave and wise article.